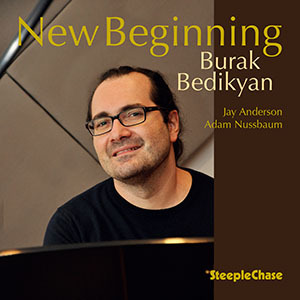 Burak Bedikyan (piano); Jay Anderson (bass); Adam Nussbaum (drums). It's five years since I reviewed Burak Bedikyan's Circle of Life. I was impressed by the young (35 is young to me) Turkish pianist. Since then, he's moved to New York, picked up a couple of A-list sidemen and produced an album of impressive originals plus one standard - Stella By Starlight (every jazzman must have a recording of Stella on his CV, it's a rite of passage!) Bedikyan, however, gives the lady a workout in 3/4 time. Needless to say, he does her proud as he does the originals. The originals rubber stamp the man as a composer albeit not without several references to other tunes during his solos - don't they all! Anderson and Nussbaum are with him all the way and both are excellent soloists in their own right. If you like a piano trio that nestles comfortably in between say, Garner, Peterson and EST then, this is for you. And, when, finally, the roll is called up yonder over there, the Burak Bedikyan Trio will be in there as contenders vying for a seat at the right hand of Art Tatum.